If a picture is worth a thousand words, a good melody is worth a million. Rent? The PG-13 musical about the people who won’t pay their rent? Who break into the building when they’re locked out? Some of whom are drug-addicted (or formerly drug-addicted)? With all that language? A main character who works as an exotic dancer? And most of the rest of the characters have no obvious gainful employment? Many would also have difficulty with the characters who are gay, lesbian and transvestite. The most dysfunctional couple is the straight one (though the lesbian couple is a close second at times). The musical with lines like: “I didn’t recognize you without the handcuffs,” or “There will always be women in rubber flirting with me!” National Review Online hated it (though I can’t find the link). It’s definitely a PG-13 musical. I probably wouldn’t even have watched it with my 14 year old daughter a year ago. And there are scenes that make me awkward to watch with my older children (younger son had to play upstairs), along with things we had to explain. But, the more I thought about the musical, the more I saw. 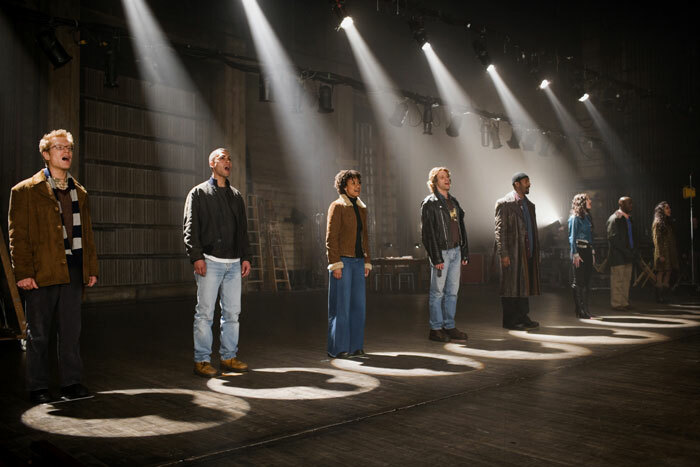 And, as I mentioned in my previous post about Rent, when I get a new musical, I become totally absorbed in it. I’ve had the music going through my head for weeks now. Rent is not an easy musical. Characters waste away and die of AIDS (which is almost a character in itself). Most of the major characters have AIDS. Mimi goes through withdrawal and, later, almost dies. Mark and Roger seem as if they’ll never achieve what they aim for in their art. Roger is bitter and closed up. His former lover committed suicide after they both were diagnosed with AIDS, and he’s just finished rehab himself. Collins loses Angel. Joanne, in many ways the most “normal” of the group, is in love with Maureen (a self-absorbed, performance artist diva). This situation is so difficult that Joanne and Mark sing a song, “The Tango Maureen” (to the right), about being in love with Maureen (“As she leaves you dangling, Your heart she is mangling”). And there’s always the rent they can’t pay, and the money they don’t have. But, what money they do have, they share – like the first Christians in the Book of Acts. When someone gets money (okay, legally or illegally), they buy dinner for the others, pay rent, and help the others out. That’s part of their anger at Benny, the owner of the building. Not did he betray their group by demanding back rent when he had said, a year ago, that they could live there rent-free, but also because he (a former roommate and member of their group) wants to make money off of them. He has money now, and, rather than help the others, like they all do, he just considers them a source of income. He’s betrayed them – betrayed their community. There is no future. There is no past. Thank God this Moment's not the last. There's only us. There's only this. Forget regret or life is yours to miss. No other road. No other way. There's only now. There's only here. Give in to love or live in fear. No other path. No other way. “Consider the lilies of the field, they neither toil nor spin. Yet I tell you that even Solomon in all his glory was not arrayed like one of these…Therefore do not be anxious for tomorrow; for tomorrow will care for itself. Each day has enough trouble of its own.” (Matthew 6:28-29, 34) Because of their situation, they must live day to day, thinking not of tomorrow. “Love…bears all things, believes all things, hopes all things, endures all things.” (1 Corinthians 13: 4, 7) Roger is bitter and angry and doesn’t want to get into a relationship with anyone, especially someone who, like Mimi, is a drug addict. Mimi has fallen in love with him, however, and keeps trying to start, and keep, a relationship with him. When he sings that he’s got baggage, she replies, “I’ve got baggage too, I’m looking for baggage that goes with mine.” He is not easy to love, but she keeps on trying. The second time they sing it, some of the characters gradually vanish from the scene. “I was sick, and you visited me.” (Matthew 25: 36) In the second half of the movie, Angel is in the hospital dying of AIDS, and her friends come to help and comfort her. They lovingly paint her nails when she’s lying in the hospital hooked up to machines. They are trying, as much as they can, to help her keep her dignity. Although she is a recent addition to their community, Angel, in many ways, helps to keep that community together, and the going gets rocky after she dies. Her introduction is reminiscent of the Parable of the Good Samaritan, where the Samaritan helps the man beaten by robbers after others pass him by. At the beginning of the movie, Collins is beaten up and robbed. Angel comes upon him in an alley, bruised and sick, and cares for him and cleans him up. It would be easy for Angel to pass him by, especially since helping him meant going into the dark and possibly dangerous alley. At the end, their community has fractured and then come back again. Maureen and Joanne have reunited, and Roger has moved back from Santa Fe, but they are unable to find Mimi. They put up notices and persistently search the city (like the woman in the parable who, having lost a coin, does not rest until she finds it) – in Mark’s words, “Being an us instead of a them…La Vie Boheme” When they do find her, near death, they pull together to take care of her. What binds them together, and takes care of all of them throughout the musical, is their community. Their friendship. The way they work together, care and share. It’s what they had at the beginning, and what they have left at the end. I googled “Rent” “Musical” and “Christian” just to see what I came up with. Most of the objections that some Christians had to Rent are included in the first paragraph, but there was one further objection that I found - that the good parts of Rent would seduce people into accepting alternate lifestyles. My lifestyle is pretty unchanging. I find a different danger for myself – that, despite my recent experiences with churches, Rent may seduce me into believing in community again. I came across this entry on NCBlogs.com and I must say that you were the first Christian to give a viewpoint on the musical that wasn't negative. Now I know that many Christians would object to the things mentioned in the 1st paragraph of this entry, but you give a perspective that even this agnostic, who loves Rent has never thought about. Thanks for the perspective, I enjoyed reading it and thinking about it further. Thank you! I especially love musicals, movies and books that have more to say the more you think about them - like Rent. hey i stumbled across this pretty randomly actually, oh the vastness of the internet, as a fellow christian and musical lover, i loves this movie, but never thought of it relating to christian themes so when i saw this i said to myself "This, i have to read"
Thank you, Pireateninja! I was surprised, myself, when I started coming up with these themes. One thing: The sort of "theme song" is "No Day BUT Today" not "LIKE Today". Also, I find it kind of wrong that people would strongly object to seeing a movie like this with their 13+ year old children when there's trash like "Family Guy" on TV that they would let their kids watch. (I'm not attacking you, I just felt the need to point this out.) In addition, the music may swear once or twice per song, but that nothing compaired to today's pop music (i.e. : Gwen Stefani's "Hollaback Girl" in which she says s*** at least 20 times). Snow: Thank you for setting me straight on the song. I've fixed that in the post. I also understand your thoughts about what's on TV/radio versus "Rent." At the time I wrote this, we didn't really watch much on regular TV - there are so many good movies to rent, and we find commercials intrusive (even now the only regular show we watch, "Battlestar Galactica," made up their own swear word (grin)). The same goes for radio - I change the station when the commercials come on. But, from what little I've seen, I agree that "Rent" isn't any "worse" than lots of what's out today - and the story is so much more worthwhile! Hey! Congrats! I'm catholic and we are looking forward to produce Rent in my country. I must say I am very glad to see this.. because I found this (Christian - Catholic, whatever it is the same) perspective of Rent long time ago, and didn't know how to "prove" it or put it in words... The most important theme of Rent I believe is love, like for Jesus is "to love each other as I have loved you"... Because "at the end what matters is what you did for God and the people" like Marcial Maciel said... Now I can share these thoughts to my partners that also love Rent.. Thank you! Wow this is cool info thanks for this guys I will show this to some of my friends that might be interested! Daniel T: I hope you enjoy producing it. I've seen it three times, and it touches me every time. Having Rent relating to christian themes is obsurd, a jewish man wrote the show. Thank you so much! I'm a proud Catholic and I love RENT! When I tried explaining just that since the movie was about AIDS to my boyfriend's super-Catholic mom she had this look of disgust on her face. I see at as a reminder that just because people live other lifestyles, especially those of sin, doesn't mean they can't be good people. It also showed me how big of a problem AIDS is an how we need to bond together to fight it. I just stumbled upon this post through a Google Images search that turned up one of the pictures you posted here. As an Atheist, I wanted to commend you and most of the people who have posted here. I may not like the Bible, but I definitely agree with the connections you have made with the passages you have quoted. Some of the connections are even necessarily "Christian" in nature rather than having the idea of being connected and supportive of your community (no matter the size or people who constitute it). I greatly like that you are very well thought out in your blog post here, and I enjoyed reading it. I am a 17 year old Christian male who happens to love musicals. lol. I was concerned in the beginning that I was not "allowed" to see RENT or have anything in relation to it. My family is very religious and is dedicated to what they believe in, so you might understand the pressure I was (and in ways, still am) to bring the subject forward. They still do not know that I have the soundtrack on my iPod or have the movie on DVD, I am not sure if I should tell them what it is about. My father, who in ways seems like he doesn't believe in anything, rudely comments on the "fa**ots" and "di*es" and I am not okay with that. Sometimes I question my mother's beliefs in him due to the fact that she is Christian, herself. Most of my friends are gay or bisexual. I see this movie and the musical not as what it is visually, but what its message is. I know that now with these themes, I can in a way attempt at telling my family what it is about. I am not sure. I posted a quote from the musical on my Facebook page ("No day but today.") and a comment I got from one of my friends was. "Don't sing RENT! Ewww." He is a Christian and attends church regularly just as I do. I don't see why people have to be so hypocritical about the show. Apparently he has seen it or something to know where I quoted from, but I can't fathom trying to get through to anybody with what the movie faces with the drugs, sexuality, etc. He is a good friend that speaks well of us behind our backs.